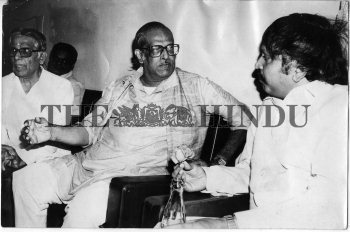 Caption : Hrishikesh Mukherjee (centre), president, NFDC, who inaugurated the Panorama Film Festival during May 1986 in Bangalore, the Capital of the southern Indian State of Karnataka discussing a point with Dr. Jeevaraj Alva, Karnataka Information Minister who presided. Mr. R. Lakshman, president, Karnataka Film Chamber of Commerce, looks on. 1986-05-15.